We're sorry; this specific copy is no longer available. 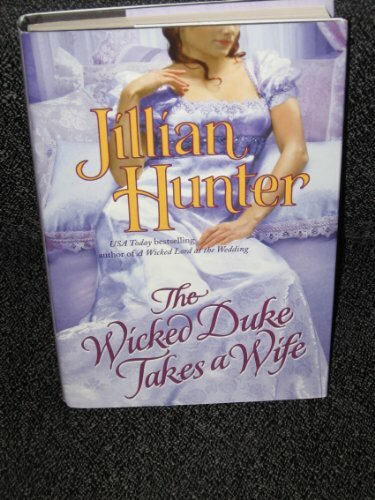 Here are our closest matches for The Wicked Duke takes a Wife by Jillian Hunter. Synopsis: From London's ballrooms to its sizzling bedrooms, award-winning author Jillian Hunter spins a seductive dance of desire and breathtaking romance. Lord Griffin Boscastle has no intention of ending his glorious career as a rakehell now that he has inherited a dukedom. Still, there are responsibilities he must discharge before his pleasures resume, including finding a bride, and depositing his incorrigible niece at a relative's academy outside London. It is at this so-very-proper finishing school that flame-haired instructress Harriet Gardner awakens in Griffin emotions so dangerously intoxicating that he must avoid her at all cost. Yet when Harriet finds work in the townhouse where Griffin resides, her presence tempts him at every turn. Harriet has survived London's streets far too long to let an arrogant duke woo a bride he doesn't want when she desires him for herself, and she has seen too much of life not to recognize a man ripe for redemption. But just as Harriet finds the perfect cure for His Lordship's devilish ways, a vindictive enemy intervenes, and the duke whom Harriet has plotted to save suddenly becomes her devoted protector.